Many modern video projectors provide the means to adjust the image to fit on a tilted wall, but these adjustments have their limitations. Fortunatelly for you, your boss and co-workers, these things are not a big problem when you're just watching a PowerPoint presentation. But, some times, the image quality is mandatory. For example, when you're on a flight simulator, you want full immersion. If the images you see are distorted or not perfecly aligned, your brain won't believe you're on flying capsule, thousands feet above earth. And, if you're inside an flight simulator, you want your brain deluded be the images your eye see! As you can see, the image is too large to fit on a single projector. So, we need to slice it in 3 different images and use 3 video projectors horizontally-aligned to create a single large image. You can clearly see the problem here: Besides not being correcly aligned, the image has brighter spots where the slices overlap. This is'nt good for an immersion system. Moreover, remember that our screen is cylindrical. But the projectores send flat/plane images. 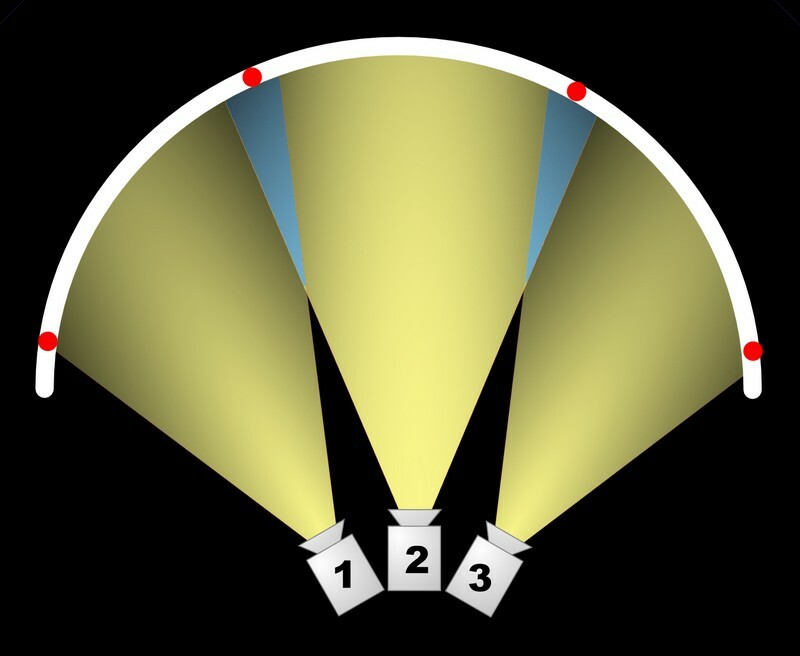 This lead to a distorted image, since the projector "expects" the image hits a flat surface, and not a cylindrical one. This problem is even worse when we use a spherical surface. And how can we solve those problems? Many times we can simply adjust the angles at the projectors and use modern (And really expensive!) projectors that can pre-distort the images according to the screen geometry. But this takes a long time and may not be perfect, because there's a lot of human interaction. So, how about creating a system to automatically detect the screen position and it's geometry, so we could matematically calculate the distortions in advance? Then we could fix the image before it's projected, perfecting the image hitting the screen surface. 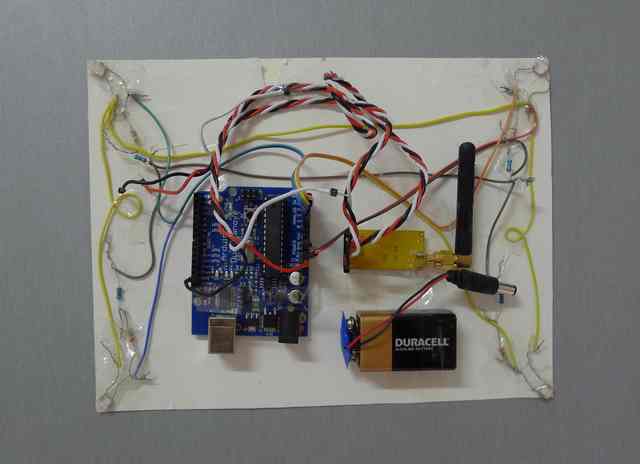 This project uses an Arduino and some light sensors to help the computer generating the image to detect where the screen edges are. If you look back at our projection system above, this is the equivalent to find where are the red dots on the screen. If our system detects where those dots are, it would be able to ajust the images to be aligned around the dots. We aren't fixing the geometry distortions yet, but we could minimize this problem if we have a lot of detection points (red dots) around the image, breaking an spherical surface in a series of small flat surfaces. You can see the light sensors (LDRs) placed on each corner of our projection screen (The white peace of paper behind the circuitry). In the original project I've followed Johnny's original work, using a sequence of binary patterns to detect the screen position. This method is really fast. But, this time, I was more concerned in precision that speed. So I changed the patterns sequence for 2 scanning beams sweeping the screen. This didn't gave me just more precision. Its also more futuristic, with this Hollywood-like light beam crossing the room, scanning every inch of the room. This result in such a good visual effect that is hard to not thing about several other applications for this project, like video mapping.